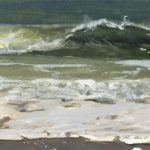 For nearly two years, artist Lorena Pugh has been painting with one mission: to capture the waves, coves and creatures of Narragansett Bay. Join us at Dryden Gallery at Providence Picture Fram on Saturday, Oct. 6, 7-9 p.m., for the opening of “21 Months, 147 Miles: Lorena Pugh Paints the Bay.” The show, benefitting Save The Bay, features 150 paintings of the scenes and creatures that make Narragansett Bay so uniquely stunning! Save The Bay members with their membership card are invited to a private reception and exclusive preview of the exhibit at 6 p.m.